After smoking for 35 years, Owens died of lung cancer at age 66 in Tucson, Arizona in 1980. He is buried in Oak Woods Cemetery in Chicago. A few months before his death, Owens had tried unsuccessfully to convince President Jimmy Carter not to boycott the 1980 Moscow Olympics, arguing that the Olympic ideal was to be a time-out from war and above politics. A member of what the Nazis mockingly called America's "black auxiliaries," Mr. Owens achieved a feat unmatched in modern times in Olympic track competition. The year before, with a wrenched back so painful that he could not dress or undress without help, he broke five world records and equaled a sixth, all within 45 minutes. 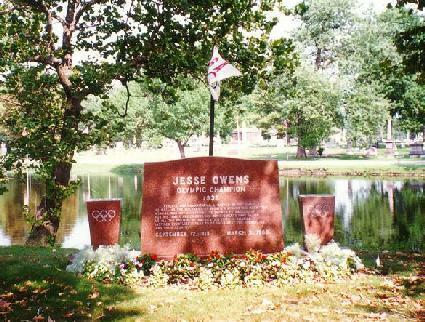 Jesse Owens died from complications due to lung cancer on March 31, 1980 in Tucson, Arizona. Although words of sorrow, sympathy and admiration poured in from all over the world, perhaps President Carter said it best when he stated: "Perhaps no athlete better symbolized the human struggle against tyranny, poverty and racial bigotry. His personal triumphs as a world-class athlete and record holder were the prelude to a career devoted to helping others. His work with young athletes, as an unofficial ambassador overseas, and a spokesman for freedom are a rich legacy to his fellow Americans."